Halogenation of alkenes is the reaction in which a double bond is broken and replaced by a vicinal dihalide – 2 halogen atoms added to neighboring carbons. This reaction follows a pattern of anti addition. The goal of this video is to help you understand rather than memorize concepts related to the halogenation mechanism. This video addresses dihalide polarization, bromonium/chloronium bridge formation, addition to cyclic and assymetrical starting alkenes. This is Video 3 in the Alkene Reaction Mechanisms Video Series. Click HERE for the entire series. Do you have any videos on Radical Rxns, NBS, Allylic carbon, how to calculate delta H for propagation steps? That is what I am doing now in my Orgo II class. Hi Leah, I think you are doing a fantastic job. I think you can add a DONATE button so that people can donate to you. It is another way people can say thank you!! In the last example, propene reacting with Cl2, do we still worry about stereochemistry? Hi all. The description of resonance in the bromonium ion intermediate is rather misleading. The contributing structures have no independent existence. There is no “back and forth” between them. The actual structure is a sort of average of them, and always contains two bonds to the bromine atom. Hi Leah, I’m confused as to why the bromine in the bromine bridge has a positive charge, when it has three lone pairs, and two bonding electrons. Shouldn’t it have a negative charge? Or maybe should have only two lone pairs? 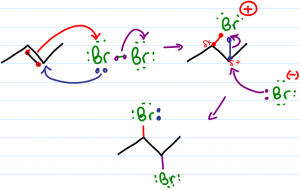 Actually the bromine in the bridge has two lone pairs and two bonding pairs. Since bromine is in group 7, the calculation is 7 – 2×2 -2×1 = +1. hello, so if the bromine in the bridge has two lone pairs and two bonding pairs, where are the pair electrons we started with gone to?? thank you very much for those videos !